Disney is making dreams come true this year with the announcement that in 2015 the line will debut voyages to the icy fjords of Alaska and Norway. Kicking off this summer, the itineraries will transport passengers to the stunning scenery that inspired Disney’s hit flick, Frozen. While some Disney cruises only feature one or two shows these extra special itineraries are entirely inspired by the 3D computer-animated musical fantasy. The interactive experience offers guests the chance to spend the entire cruise reliving the film’s sparkling winter wonderland. 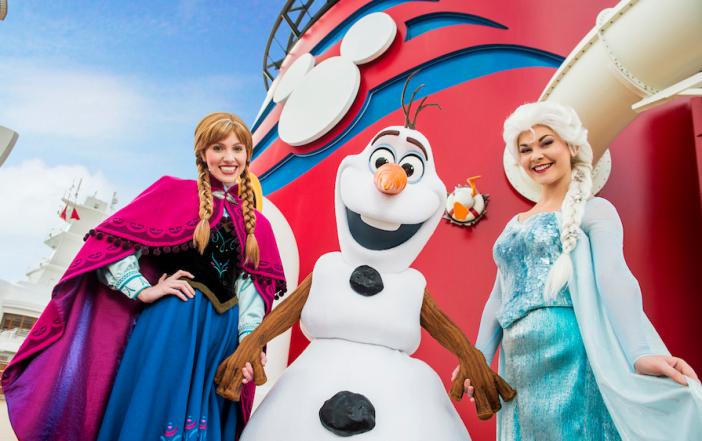 From deck parties, musical stage shows and on-board character meet and greets, the sailings transport Frozen fans into the midst of a perpetual winter that brings Princess Elsa’s icy kingdom to life. As well as on-board fun passengers can also head ashore to explore the fairy-tale village of Alesund. In classic Disney style the line has gone all out to offer its passengers an unforgettable experience. The crew pull out all stops to reinvent the whimsical Kingdom of Arendelle! Overnight, the atrium lobby will be swept by a magical freeze that sees glittering icicles clinging off the grand staircase. As the day grows longer the freeze will start to engulf the upper decks, adorning them with intricate snowflakes and powdery snow. When the sun goes down passengers are invited to a fun filled ‘Freezing the Night Away with Anna, Elsa and Friends’ deck party. As well as Arendelle’s pretty princesses guests will also be greeted by Kristoff, Olaf, Sven and the trolls. Top things off with a performance of Elsa’s hit song ‘Let It Go’ and you’ve got a recipe for a rocking party! When the little ones head to bed adults can hit up the ship’s nightclub for Frozen inspired drinks. By day, passengers can take part in some exciting new shore excursions to storybook villages, natural wonders and amazing architecture. To secure a place on one of Disney’s seven or nine night voyages head to Cruise 1st for magical deals that will have you feeling fabulously Frozen in no time at all! Images sourced via Disney. Credit: Disney Parks.